This is a scarce c.1929 pocket map of Chicago, Illinois issued by the Chicago Motor Club. This street map covers Chicago from Glenview and Wilmette south as far as Riverdale, Robins and Crestwood and from Lake Michigan west to Cook County Airport. This highly detailed map notes streets, house numbers, parks, airports, townships, villages, tourist camps, clubs, piers, rivers, lakes, and transportation lines. A street index in included on the right hand side of the map. Although this map is not dated, the address of the Chicago Motor Club, at 66 East South Water St. and Telephone FRAnklin 1818, help date this map to 1929. 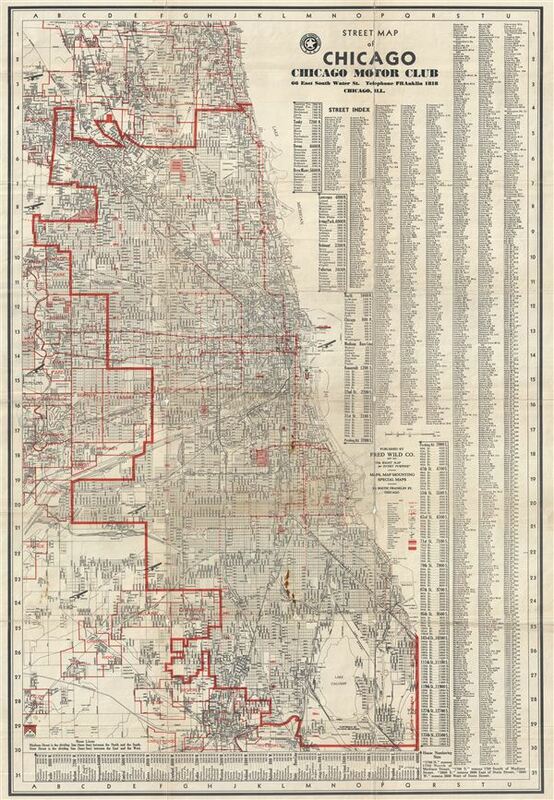 This map was copyrighted by the Hearne Brothers and published by Fred Wild Co. for the Chicago Motor Club. Very good. Minor wear and toning along original fold lines, with minor damage along fold intersections. Foxing at places. Professionally flattened and backed with archival tissue.